Employees that are well trained and managed can be a company’s greatest asset, but also the greatest expense. This can be a problem when your employees are working offsite on service calls all day, since you cannot be there to manage all of your employees. 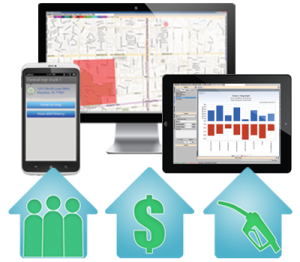 By using real time GPS vehicle tracking you can keep track of where your employees are during the day. Allowing you the flexible to change schedules, routing drivers around heavy traffic that could cost the company hours of time. Ensure that employees are spending the right amount of time at a customer’s location and are not going home early for the day, or taking long lunches on company time. How do you know your employees are following company rules? With GPS tracking it is very easy by tracking an employees work vehicle you can catch employees who are dishonest on their logs. Using company vehicle to do personal errands taking unauthorized breaks, reduce the amount of time that employees are claiming overtime. Excessive driving for lunch breaks or 30 minutes to an hour and back just so they can have lunch with the guys potentially wasting almost 3 hours on a lunch break. With GPS vehicle tracking you can track whether employees are speeding with company vehicles. You can catch driver who are driving in an unsafe manor and correct the problem before the police issue tickets, which can increase your insurance costs. If your company drivers have passengers then you are also looking out of their safety as well since the risk of injury is disproportionate to the speed traveled. And this can help your employees deal with false claims. Whether a person sees a dent in your companies vehicle or a customer claiming you where not at the job-site. GPS tracking it provide verification of where your vehicle and crew have been. Making sure your employees spend the proper amount of time at your customer’s location is important. If your employees are performing rush jobs so they can go home or to lunch early. This can lead to poor customer service that can cost a company business in the long term. Imagine the saving in fuel as well as wear and tear off your fleet’s vehicles if you reduce your employees from idling the vehicles at the job site, or ensuring that personal errands taken out of the daily work routine or they are not driving across town for lunch. If your company can extend the life span of its vehicles that can reduce capital expenditures leading to savings. This can be achieved by eliminating personal usage, idling that uses up a vehicles engine lifespan and side jobs that employees can do with company vehicles. Aggressive driving habits like speeding that can be hard on engines or breaking that shorten break life.